Alan Wake to "Blur Lines Between Games and TV"
The upcoming Alan Wake will be the closest thing to a TV thriller gaming has ever seen when it comes out (supposedly) later this year - according to Microsoft, anyway. First announced back at E3 '05, psychological adventure Alan Wake has been lost in the mists of development hell for years, becoming one of those titles that's second-tier only to Duke Nukem Forever in terms of vaporware jokes. Now, it looks as though it's finally coming out this year, what with them actually showing off the gameplay at E3 '09. The game stars a bestselling novelist named, well, Alan Wake, who travels to a remote town with his wife to get inspiration for a book, but things go wrong in a manner reminiscent of shows like Twin Peaks or the works of Stephen King (to name a few). Comparisons to Twin Peaks and Lost are completely intentional, however, as Microsoft product marketing manager Laura Disney told CVG - Alan Wake is intended to be the closest thing that gaming has to a top-class TV thriller. "Alan Wake is on track from a development standpoint and will play an important role in our Spring 2010 game portfolio," said Disney, noting that Remedy had been polishing the game tremendously over the past few months (considering that they've had five years to work on the damn thing, one would hope it'd be polished). "The time Remedy has spent on Alan Wake is indicative of the final result players can expect to see. 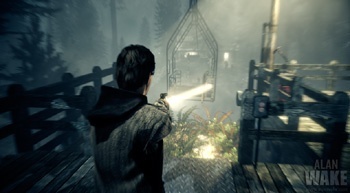 The storyline will run as a driving factor throughout the game, creating an atmosphere that captivates the player in a way that many straight-out horror games do not ... Alan Wake will blur the lines between video gaming and television, and play on the strengths of both to create something truly compelling." My first instinct is to be snarky and say that "video games are already on your TV, duh!" But you know what? I'll give them the benefit of the doubt and take it seriously - it's obvious that Microsoft is poising Alan Wake as a challenger to the similarly line-blurring Heavy Rain, though how the more traditionally "game-like" Alan Wake stacks up against the "interactive novel" of Quantic Dream's PS3 exclusive remains to be seen. Okay, okay, I can't go completely snark-free: It's good to see that Remedy is striving to blur the line between something other than "released game" and "unreleased game" for once.